Knowing that there was a Strava segment around the outside of the city wall made the temptation to run in the morning a very strong one. I figured at my fastest pace I should be able to top the leaderboard, but on the other hand I’d need to get up and be out at around 04:30 in the morning for this due to the 05:30 meeting time for the ferry. I think if I had have run, I’d have needed to have gone out earlier than I’d thought about. As it was it took thirty minutes to finish packing and getting ready; but we got to the meeting point ahead of time. It was a deadline we couldn't miss. The hydrofoil got us to Hvar Island in around ninety minutes with a brief stop in another port on Korčula. 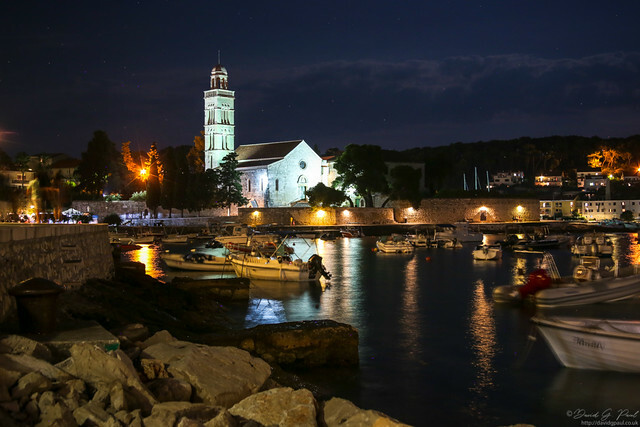 It gets confusing when the island has the same name as the largest town, but Hvar is the same. The local tour company on Hvar let us store our luggage with them whilst we went looking for breakfast. Most of the group went to a cafe, but I wasn’t keen on the smoky atmosphere there so went to a nearby bakery instead. As I ate, I went to photograph the Cathedral of Saint Stephen. 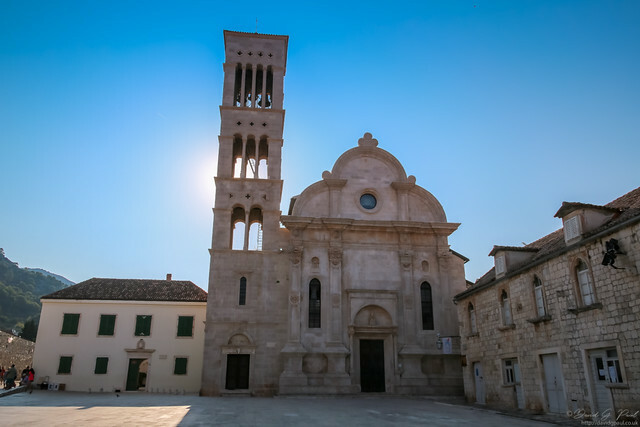 I think by this point I’d lost count of how many churches I’d photographed since arriving in Croatia. As Vlad had said, “It’s ABC: another bloody church”. Once everyone else had eaten we began our hike up the hill to the Spanish Fortress: Tvrđava Španjola. There are signs that an earlier Byzantine fort once stood where this one is, but the one we saw was the result of the Venetians wanting to protect their investments. 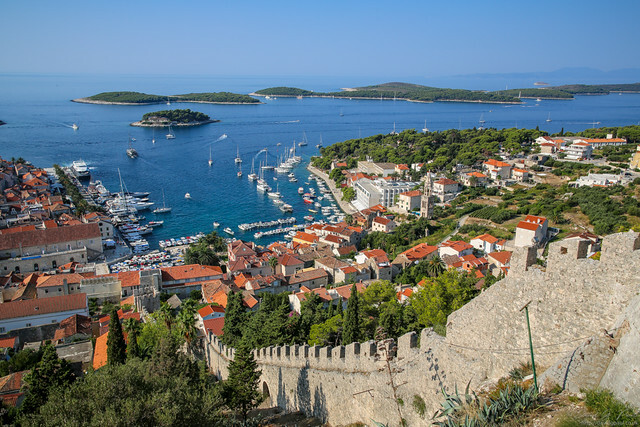 So just like Korčula, the Venetians had been on Hvar too. To get to the fortress the path zigzags a little with great views of the port and the Pakleni islands. The entrance, since the times of the Turkish attack, is around the back on the north side of the wall. I think Lindsay found this climb to be much easier than the one we’d taken in Vela Luka, though she still complained about it to Vlad and anyone in the group that would listen. For the next hour we looked around the fortress: in the towers, in the dungeon, and then the cafe for a cold drink. We were so far ahead of time that when we got to the bottom we were shown where the supermarket is, and given recommendations on restaurants. We still had another hour to spare, so the group went our separate ways. Lindsay and myself sat in the shade for a while, but then went to see if we could find one of the other churches we could see the spire for. Unfortunately we couldn’t find a way to it, but then in the heat we didn’t try that hard. We were shown to our apartments we’d have for the next two nights - ours were close to the cathedral in what seemed to be a quiet part of town. The quality of the decor was significantly better, and for the most part the facilities were too - with the exception of having a fan instead of aircon. At least it was a way to cool down. There isn’t really that much to see on this island, unless you take a bus to Stari Grad. I’d have been tempted, but I think we’d have been exposed in the sun for too long. 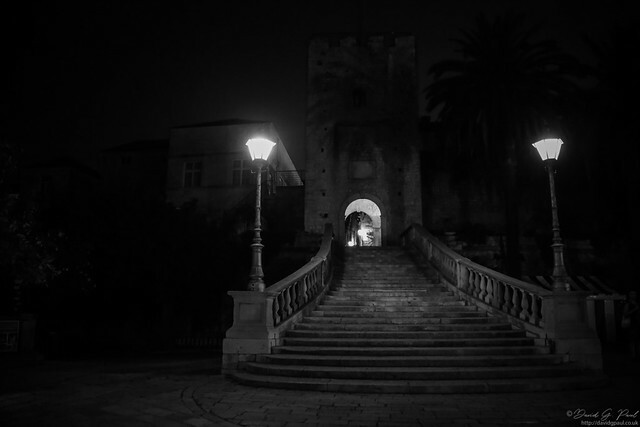 What I know of the old town is that there are places such as Tvrdalj Castle and Tito’s Caves to see, as well as any other old buildings that may be around. Instead, we wandered around Hvar and bumped into Vlad. We walked with him as far as the monastery which is where a few of the others were swimming. Marion joined us to look around the monastery and have gelato before we decided to head back to the apartment. That evening we joined the others for a meal in a restaurant not far from our place. It was a good evening, much better than the first one where we didn’t really know each other. Though that’s what the meals are for - to throw us all together and improve the experience. Night had fallen during the meal, so we went for a walk afterwards to take some nighttime photographs before heading back to get ready for a day on a speedboat.